I was born in Smithers, B.C. Canada on December 25, 1946. I grew up there and fished the whole northwest area with my Grandpa, Percival (Percy) Benjamin Emerson. He loved to fly fish. His favourite Trout fly was the Royal Coachman. He built a cabin on Babine Lake where I spent most of my summer school holidays fishing and enjoying the outdoors. Thanks to him, I am hooked on “Sportfishing” and I’ve come to love every aspect of it. My lifetime goals are to save the wild Salmon, Steelhead and Trout of the entire northwest area of British Columbia and establish a “Quality” sport fishing guiding industry. These are lofty goals but I will strive every day to achieve them. They are “my life long calling”. I have been married 52 years to my wonderful, beautiful wife Gail and have three daughters, seven grandchildren and two great grandchildren. I started fishing the Terrace area in the 1970’s. On May 24, 1983 I assisted my friend to land an 83-pound Chinook on the Kalum River. It was the river record. That experience changed my life and I started into the fish guiding industry and began exploring and fishing rivers by jet boat. I pioneered drift boats on the Kalum and Kitimat Rivers and taught many folks how to row them. I’ve owned a fishing lodge and guide business (Northwest Fishing Guides & Lodge) along with my wife from 1986 to 2001 when we sold it and retired but my love for the industry is just too great and after five years - I am back. 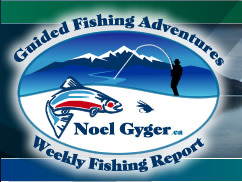 I have written weekly fishing reports from 1996 through 2002, so doing them again is nothing new to me. Those reports can be read on this website. I have written articles for the magazine British Columbia Sport Fishing, Rikk Taylor publisher. I have assisted and hosted many outdoor writers and links to their articles are posted on this web site. I am an AVID Sportfishing writer with articles published in many Sportfishing magazines and on the Internet. I have assisted Italo Labignan and Henry Waszczuk of Canadian Sport Fishing in shooting 11 fishing shows in Northwest British Columbia and will try to make shows into the future. 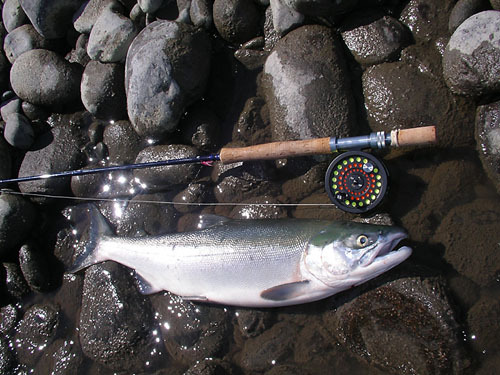 I have made a fishing video for Chinook Salmon and Steelhead on the Kalum River in May of 1991 with Larry Schoenborn of Fishing The West television series, United States market. I have assisted Jim Teeny and Larry Schoenborn in making a fly-fishing video on the Kispiox River in 1991. From Oct. 11 - 13, 1996 I was pleased to host and assist John Barrett produce shows for his Flyfishing the World series that has aired on ESPN and all over the world. His guests were actor Lee Horsley and Steve Abel of Abel Reels and Quality Products. I have hosted and guided Mark Anthony Krupa who recently started his own fishing show on OLN titled “HOOKED” with Mark Krupa”. Tune it in…this is “truly” a five star show. Mark is also a five star outdoor writer and fishing photographer, his photos and articles have appeared in many outdoor publications. I have produced and marketed my own ” two hour “ feature presentation videos. 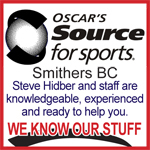 There are separate (spin tackle) “SEASONS REVIEWS” beginning 1987 through 1995 (nine guiding seasons), plus fly-fishing only and ocean tapes. These tapes are “not” professionally produced but are my own amateur video clips that show folks catching fish and having fun. 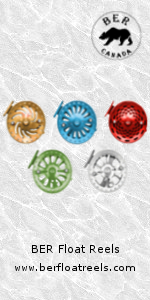 That said…let me know if you want to purchase these. I am a member of the Provincial Quality Waters Management Committee (PQWMC), since the beginning for over nine years now. 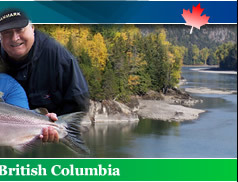 I am a member of the Regional Quality Waters Management Committee (RQWMC) which covers all of northwest BC commonly known as Region 6 in the Freshwater Fishing Regulations synopsis booklet. I am a member of the North Coast Steelhead Alliance (NCSA) protecting wild Steelhead forever. I am a member of the Skeena Watershed Conservation Coalition (SWCC) conserving sacred head-waters of the Stikine, Nass and Skeena. 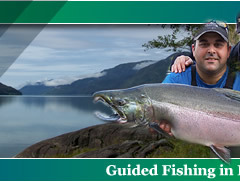 I am a former chairman of the Skeena Angling Guides Association (SAGA) that had over 32 members. I was their chairman for over 10 years. Cast here for photo of the gift-of-appreciation. Along with the gift came a card signed by the members and I must say the words on the cover were "profound". Cast here to read the words. Thank you SAGA, it was my pleasure to serve you. I am a former member of the steering committee for Friends of Wild Salmon (FOWS) a coalition formed to protect wild Salmon and Steelhead. I am a member on the Habitat Conservation Trust Foundation (HCTF) Technical Review Committee. Cast here to read a thank you letter. A plaque made for me by my daughter, hangs above my office door, describes me to a “T”... I’D RATHER BE FISHING! Contact me anytime; I am at your service. Let’s talk fishing! I first met the legend Jim Teeny in the early 90s when he came out with the late Larry Schoenborn to shoot a fly fishing Steelhead TV show on the Kispiox River. Larry had asked me if I could supply two drift boats, I said sure, no problem. It was an honour to be asked. One boat for Jim and Larry and one for the TV crew. I rowed one boat and my dear friend, the late Ed Schulmeister, rowed the other. My boat took Jim and Larry and Ed took the camera crew. The regulation on the Kispiox is power boat ban and you cannot fish from the boat, the boats can be used for transport only. We launched above the Sportsmen’s Lodge for a drift of about 6 miles. We covered a lot of water and fished many tail-outs and pools. Unfortunately we did not have any luck higher up. It wasn’t until we got to our take-out where we found the Steelhead and Larry’s camera crew shot a wonderful show. Larry Schoenborn produced “Fishing the West” TV show and "Larry’s Travel Agency" out of Portland Oregon USA. Ed and I were not paid but all our expenses were covered by Larry. I can honestly and proudly say Ed and I thoroughly enjoyed the experience. Jim had fished the river a few years back and knew a few of the runs, but at that time did not have a boat therefore his fishing was limited. When the shoot was over and we were back in Terrace I invited Jim and Larry to fish on a few of our local rivers. We fished on the Zymoetz (Copper) River and a small tributary called the Clore. On the Clore, Jim landed a beauty. Larry could not fish as he had injured his right hand. We also fished the Lakelse River which at the time was crowded with anglers fishing for Coho. Jim blew away anglers with his casting skills by using his world famous “Teeny” lines and an assortment of “Teeny” flies. He could cast from one side of the river to the other with no effort. WOW did this look good. From this trip we gained a lot of guiding business for my lodge. Jim knew many people. Many of them from Hollywood, such as movie star agent Skip Brittenham. Jim came back the next year with his wife Donna and Skip and his wife actresses Heather Thomas. Henry Winkler (the Fonz of "Happy Days" TV show) was supposed to be along but had to cancel last minute. I fished with Jim and Donna on the Kitimat River in May of 1991 and landed a very nice Steelhead with one of Jim’s flies, it was a Black #2 Teeny Nymph and a T-300 Teeny line. Before Jim’s group left for home I bought a Jim Teeny Fly Vest for myself and a bunch of Teeny Nymph flies to sell at my lodge Tackle Shop.